It seems that many users are having trouble understanding what is the actual hashrate they get from their 5-chip Gridseed ASIC miners, the reason for that is partly related to how the Gridseeds are handles in different miner software and the difference in what is being reported. We are starting with the bfgminer 3.10.0 with Gridseed support running a single unit – see the screenshot above as the example that we are going to talk about. 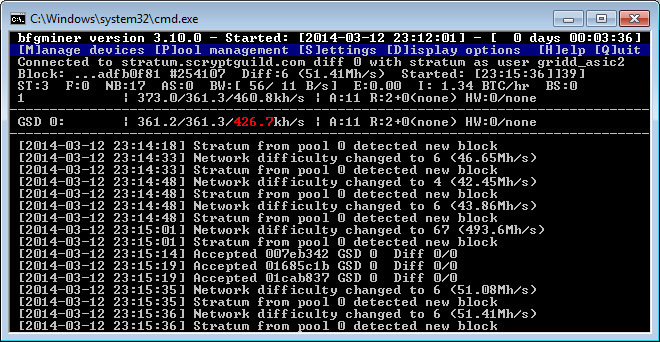 Note that the bfgminer has just been started and there are 11 accepted shares, 2 rejected and 0 hardware errors. The first number showing 361.2 KHS is the local hashrate of the miner (running at 850 MHz), this is calculated based on the frequency the miner is running at and is the hashrate that you should be getting in ideal conditions, however normally the conditions differ. The actual hashrate you are getting is the third number, the one we have marked in red, so that you can clearly see what we are talking about. That third number shows the actual hashrate based on the number of accepted shares and their difficulty, it takes into account the rejected shares and the hardware errors you get. 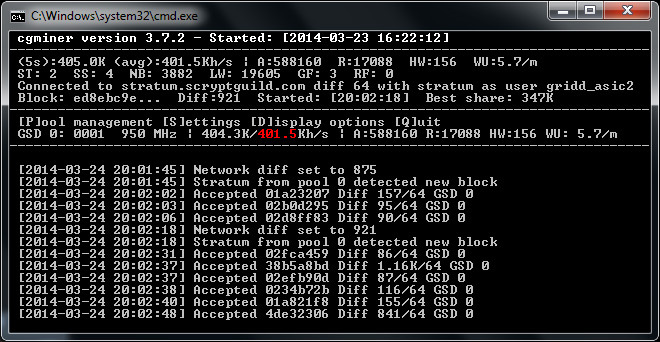 The number is calculated as an average since you have started the miner software. The question that you are probably going to ask is why if in ideal conditions we should be getting 361.2 KHS here we have 426.7 KHS as actual hashrate. The reason for that lies in the fact that we just had 11 shares accepted and we had luck so that their difficulty was below the average, so the reported hashrate is averaged over a very short period of time and is not what we should be getting in the long run. You need to leave the miner run for a longer time in order to have a better representation of the actual hashrate you will be getting, but in the long run you are most likely going to get a result that is a bit lower than the optimal value of 361.2 KHS. In the second example we are going to be looking at cgminer 3.7.2 modified to support Gridseed. In the example above we have a single miner overclocked to run at 950 MHz and the software miner has been running for a few hours already. Again the first number that shows 404.3 KHS is the theoretical hashrate in ideal conditions that is based on the operating frequency of the miner. The second number that we have marked with red is the actual hashrate that we are getting with this ASIC device running cgminer. The second number takes into account the time the miner is running, the number of accepted shares and their difficulty, the number of rejected shares and the hardware errors the device is getting. So instead of 404.3 KHS the actual hashrate we are getting is 401.5 KHS in this case and this is the result we are getting with the cgminer running for 4 hours. If we take a look at the hashrate reported by the pool for the Gridseed ASIC miner using the cgminer example above we can see that the pool reports 398.46 KHS and not 401.5 KHS. The number of submitted shares and rejected ones reported by the pool is also different. The reason for that is that the pool statistics has been reset about 8 hours before starting the miner and the statistics in cgminer is for about 4 hours only. The reported actual hashrate of cgminer is based on 4 hours of running, however the reported hashrate by the pool is based only on the shares submitted in the past 1 hour. Different mining pools base their average hashrate on the number of shares submitted in the last X minutes and that period can vary between 1 minute to 1 hour or even more. And as with the software miners not being able to report very adequate hashrate in just a minute or two, if the pool reports hashrate based on the shares submitted over a short period of time it might be reporting lower or higher values that are not close to the real one. Looking at the right number in bfgminer or cgminer should give you a pretty good idea on the actual hashrate you are getting, also pools that average hashrate over a longer period of time such as at least 5 or 10 minutes can be used to give you a good idea. The first miner available with support for the Gridseed ASIC devices was a modified version of cpuminer that however does not report local or actual hashrate as that software miner does not keep statistics for the number of accepted and rejected shares, neither does take into account the hardware errors produced by the device. 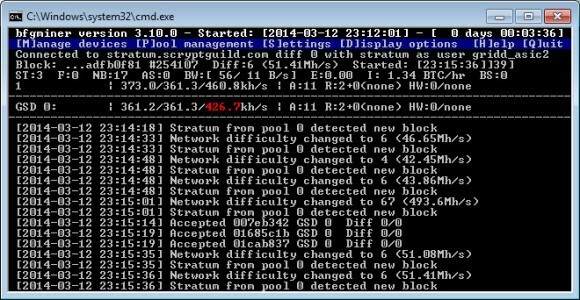 So it reports a hashrate of 0 all of the time, even though it is actually working, the only way to find what is the actual hashrate if using cpuminer is to look at the hashrate reported by the pool.